I welcome you and thank the President for his kind words. They also allowed me to rethink the birth of your Movement, the inspiration that sustains you and the goals you set for yourself. 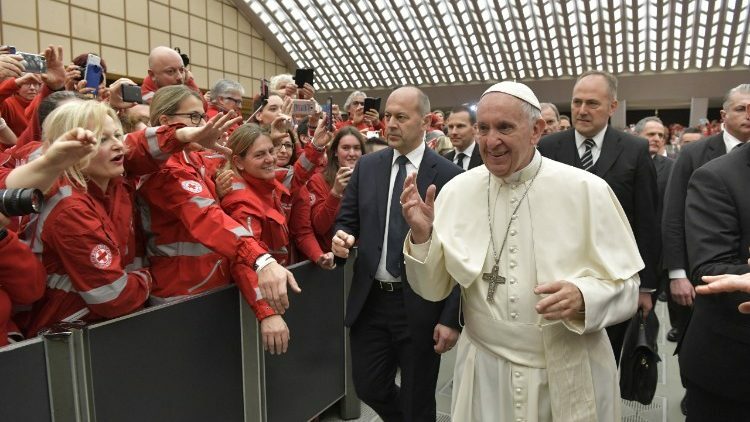 The Red Cross carries out an irreplaceable service throughout Italy and the world, precious both for the work that materially fulfills, and for the spirit with which it is carried out, which contributes to spreading a new, more open, more supportive mentality. Your action, then, deserves even more the gratitude of every citizen because it takes place in the most diverse situations, having to cope with fatigue and dangers of various kinds. It is thus in the case of assistance given to the victims of earthquakes and other natural disasters, which alleviates the evidence of the affected populations, representing a sign of the closeness of the whole Italian people. Of equal value is the commitment that you place in the rescue of migrants during their arduous journey on the sea, and in receiving those who disembark and hope to be welcomed and integrated. The hand that you stretch them and that they grasp is a high sign, which should be translated as: "I will not help you only in this moment, to lift you from the sea and bring you to safety, but I assure you that I will be there and I will take your heart to heart. fate ". For this reason, your presence alongside immigrants is a prophetic sign, so necessary for our time. I said the word "prophetic sign": the prophet - to say it in a language that we all understand - the prophet is the one who "slaps"; with his way of life, with the service he does and the words ... "slap": wake up, he gives real slaps to social egoism, to the selfishness of societies. And it awakens the best there is in the heart! But give the slap with the word and the testimony, not with the hand! The mission of the volunteer, called to bend over whoever finds himself in need and to lend him his help in a loving and disinterested manner, recalls the evangelical figure of the Good Samaritan (cf. Lk 10: 25-37). It is a parable of Jesus whose inexhaustible wealth offers us a precious light on your action and on the values ​​enshrined in your Statutes. The first of the fundamental principles that the Statute affirms is that of "humanity", which leads to "preventing and relieving human suffering everywhere" (Art 1.3). The "humanity", by virtue of which you take care of the sufferings of many people, is the same that drives the Good Samaritan to bend over the wounded man lying on the ground. He feels compassion and makes himself his neighbor: without compassion, he would keep himself at a distance, and the man stumbled upon the brigands would remain for him a faceless subject. How many, even in our world, are the children, the elderly, women and men whose face is not recognized as unique and unrepeatable, and that remain invisible because hidden in the shadow of indifference! This prevents us from seeing the other, from hearing the call and perceiving the suffering. The culture of waste - so current today - is an anonymous culture, without ties and without faces. It takes care only of some, excluding many others. To affirm the principle of humanity means then to become promoters of a mentality rooted in the value of every human being, and of a practice that puts economic interests at the center of social life, but not the care of people. Not the money at the center, no: people! The second principle stated in the Statute is "impartiality", which leads to not basing its action on "any distinction of nationality, race, religious belief, class or political opinion". It has as its consequence the "neutrality" - the third principle - for which the Movement does not take sides with any of the parties in political, racial or religious conflicts and disputes. This criterion of action contrasts the trend, today unfortunately so widespread, to distinguish who deserves attention and relief from those, on the contrary, it is not worthy. But you have a policy: this is your policy. And what is your political party? The president said it: you are from the political party of the most needy, those who need it most.